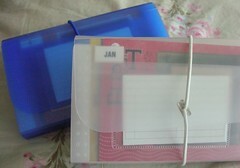 I love finding little gadgets and accessories for my stitching... boxes, bags, containers, and doodads. I especially love finding them at odd places like Walgreen's or Target. I don't know... I'm just strange that way! 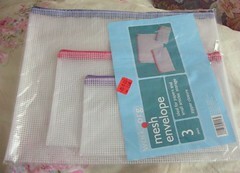 Anyway, I found some mesh bags at Target (on sale for $2.48) that come three to a bag, so I snatched up all three packs that they had there (don't ask why I couldn't have been happy with just one pack). 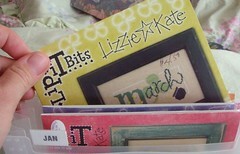 I also picked up a couple of organizers to put my small patterns like Lizzie Kate, etc in. These were just $1.99 ea. They have tabs to make them alphabetical or monthly, so I did both. In one I have all my monthly Lizzie Kate's and in the other I have them listed alphabetically by pattern name. So anyway, that's my Target finds. 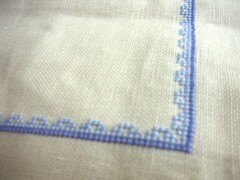 I also did a little stitching last night. I finished up the border on Spring Violets. Not very exciting, but at least tonight I can get to work on the flowers along the bottom and then I'll have met my rotation goal for this piece. 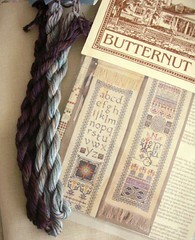 I received my Celtic Banner pattern the other day along with some of the threads I ordered. I realized I ordered the wrong threads (Watercolours instead of Wildflowers), so I decided instead of reordering the Wildflowers I would go with something different - Waterlilies because I'm using a smaller count fabric than what it calls for (32 instead of 29). I can wander for hours in office supply stores discovering all kinds of things to be used with my stash! LOL Great finds. Great traget finds! SV is looking great, thanks for the note about the floss colors will keep that in mind when I start mine. 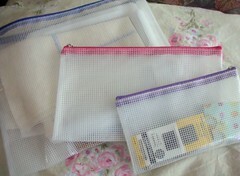 Thanks for the heads up about the mesh bags - I use those for my stitching; I didn't know that Target sold them. What a great way to organize your small charts! Mine always seem to get lost in with the bigger ones. Great progress on your new piece too! I love stationery supplies too! 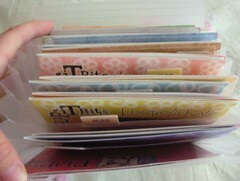 The divided folders you got for your L*K charts are great. You have some great finds there. Great progress too. So you are going to stitch CB too! :) You will love it Nicole! Those organizers and bags look great! Sigh....I miss Target! Your Caron threads look gorgeous for Celtic Banner. Does that mean a start is coming up soon?